Egypt has imprisoned more than 60 journalists, several of whom have not yet been brought to trial. Do these imprisonments violate Egyptian or international law? Egyptian President Abdel Fattah El-Sisi has been in office since 2014 when a military coup overthrew then-President Mohamed Morsi, member of the Muslim Brotherhood party. During his time as president, Morsi oversaw the ratification of a new Egyptian constitution, which sparked widespread controversy and often-violent protests. 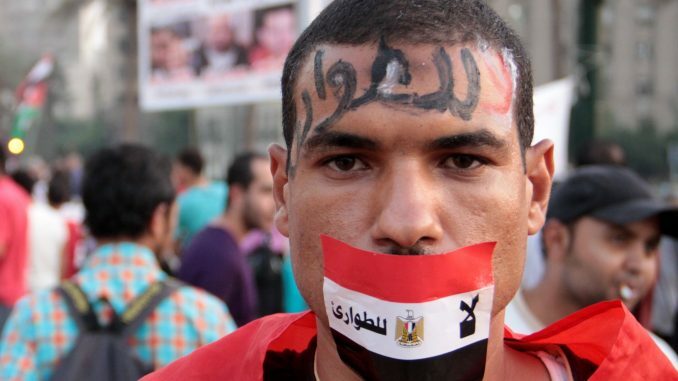 When El-Sisi assumed office, he sought to amend the constitution to placate demonstrators. El-Sisi was not intimately involved in the amendment process; instead he delegated the constitutional reforms to interim President Adly Mansour and a committee of ten legal experts. Although the constitutional referendum passed with an astonishing 98% voting yes, turnout was notably low. In the years following the constitutional reform, multiple international organizations have expressed disapproval over El-Sisi’s interpretation of the 2014 constitution, particularly with respect to the exceptions and limitations placed on the freedom of the press. Organizations such as the U.N. note that Egypt is a signatory to several international treaties which guarantee the freedom of the press. In particular, Egypt is a party to Article 20 of the International Covenant on Civil and Political Rights; this treaty stipulates that nations may only limit the free press in cases of propaganda and ‘hate speech’ designed to incite racial, national, or religious violence and discrimination. Additionally, Egypt is also a signatory of the African Charter on Human and Peoples’ Rights, but it did not fully adopt Article 9 of the Charter, which deals specifically with the freedom of the press and the right of individuals to receive information. In its ratification statement, Egypt proclaimed that Article 9 “should be [confined] to such information as could be obtained within the limits of the Egyptian laws and regulations.” Egypt also refused to fully ratify Articles 8 and 18, but here the reservations specifically mentioned the conflict with Islamic laws; the reservation from Article 9 did not. Every nation in Africa except Sudan has ratified the charter, but many do not recognize the authority of the African Court on Human and Peoples’ Rights, the official body meant to oversee the enactment of the charter. Egypt has not ratified the court’s protocol, so it seems unlikely that the court would have any power over Egypt. Notably, both of these treaties were signed prior to the 2011 Arab Spring and the ensuing political upheaval. During Morsi’s term, a more pressing concern than the freedom of press was the right to peaceful protests, as political demonstrations often turned violent. The now-void 2012 constitution guaranteed freedom of the press, except in cases of war or public mobilization. While it allowed Egyptian individuals to form newspapers, it also clearly stated that all other forms of media fall under state control. The legality of these provisions was hotly contested during the widely–publicized 2013 Tahrir Square protests. Morsi’s interpretation of his constitution allowed him to prosecute any individual he felt was a threat to the security of the state. But this interpretation may not be accurate. Several articles of the 2014 constitution describe various rights of Egyptians, including freedom of the press. In particular, Article 71 states it “is prohibited to censor, confiscate, suspend or shut down Egyptian newspapers and media outlets” while also acknowledging the existence of punishments for “impugning the honor of individuals,” a crime left to the interpretation of courts. Article 71 also allows for exceptions of limited censorship during a time of war, which El-Sisi is using as justification during his War on Terror. Technically, Egypt has not facially violated its own constitution or any ratified international treaties. Egyptian courts have only charged journalists with “harming national unity” or “provoking sedition,” which are legitimate charges under that country’s legal code. Egypt defends these actions by arguing that such charges are allowed according to Article 20 of the ICCPR. Much of the controversy surrounding the arrests stems from varying interpretations of the law. The constitution’s ambiguous phrasing allows for a great deal of flexibility for judges, and makes it much more difficult for any international organization to charge Egypt for violating international treaties. For now, the constitution is likely to remain unchanged; protests have died down in recent months, and El-Sisi faces little opposition. The next Egyptian presidential election will take place in 2018. Although no one has officially announced their candidacy, El-Sisi has expressed a willingness to run for a second term. If one of his more liberal opponents were to compete and win, it is likely that we would see yet another set of amendments to the Egyptian constitution, which given the heightened political climate, could increase tensions in an already uneasy nation.